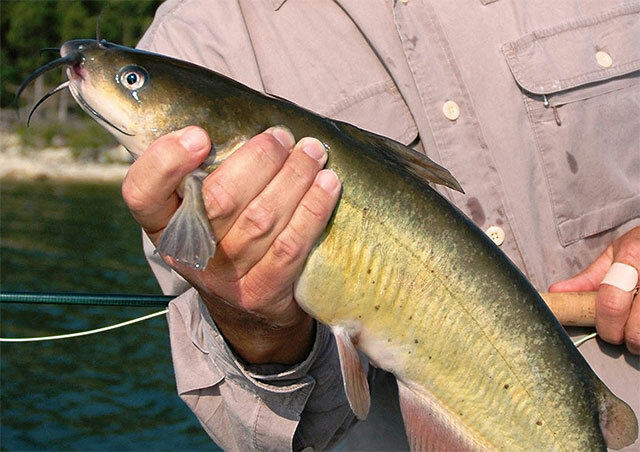 As spring fades and early summer prepares to arrive, the best time of the year to wet a line for channel cat and blue whiskerfish is fast approaching. That's according to advice from my longtime friend Bruce Hysmith, for many years the chief biologist for the Lake Texoma Inland Fisheries Station operated by the Texas Parks and Wildlife Department. For starters, the current time of the year is right as the late spring and early summer spawn arrives for catfish, a yearly happening in late May and early June regardless of the weather. “During the spawn, they can be found along windy banks," Hysmith told me a few years ago in a discussion we had about whiskerfish. Ok, nothing unusual since the wind often blows in late spring in my part of the world. But what he said next is the interview's golden nugget perhaps, especially for this current year. "(The) best thing that they like is inflowing water on tributaries," Hysmith added. If you've been following recent weather trends in much of the southern Great Plains, that's one of the few silver linings to come from weeks of deadly and destructive flooding rains that have turned Texas and Oklahoma from the drought capitols of the world into muddy quagmires. As I write this, there's plenty of inflowing water into reservoirs and lakes all over the two-state region, driving many beyond full pool capacity levels. That includes my home waters of Texoma, the Oklahoma/Texas border lake that is normally 89,000 acres in size. That's big, plenty big, making Texoma the 12th largest reservoir operated by the U.S. Army Corps of Engineers anywhere in the U.S. But in recent weeks, while as much as 20-plus inches of rain has fallen in the big reservoir's two-river watershed during the month of May, already big Texoma has swelled to many times its normal size. So much so that the lake at the confluence of the Red and Washita Rivers is currently some three and a half feet over its vast concrete spillway, only the fourth time since the lake was impounded in 1944 that the spillway level has been breached at Denison Dam. With more recent rain in portions of the Texoma watershed – and with more on the way for the next week or so according to meteorologists – it's very possible that the big two-state reservoir will exceed its all-time flood record mark of 644.76 feet above sea level. Click here for the latest Lake Texoma level. Despite the huge spillway overflow and the more than 84,000 cubic feet per second of floodwater discharge currently surging out of the lake's six floodgates. Hopefully, an advertised weather pattern change next week will materialize and turn off the late spring fire-hose that has soaked the two-state region, allowing the reservoir to begin to shrink back towards its normal pool level of 618 feet and change. And maybe, just maybe, when that drying out spell actually happens, the fishing will pick up again, albeit for a species that doesn't tend to dominate the piscatorial headlines. That species is the whiskerfish of course, an often forgotten fish that can provide some good action, not to mention the chief ingredient for a good old fashioned fish fry or two. Interested in finding some good whiskerfish angling opportunity? Then the first key is to start looking in the right place. "They’ll really crowd into inflowing water where they’ll move up in there and look for hollow logs, rock overhangs, and stuff like that," said Hysmith. The key, as with most springtime fish spawns, is the water temperature more so than the water level, as conducive as that might be right now. 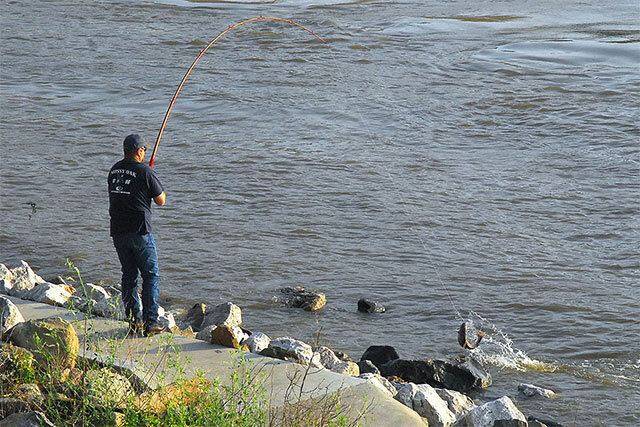 “For channel catfish, look for water in the 75 to 78 degree range,” said Hysmith. “I would say that the blues would probably spawn a little bit quicker than that since they are less tolerant of low oxygen conditions. "The warmer the water is, the lower the oxygen content of the water will be, so I’d look for (blues) to spawn first,” he added. In Hysmith’s opinion, catfish anglers in the southern Great Plains should be targeting the final days of May to the mid-June time frame for good catfish action. Of course, the farther north a whiskerfish angler is wetting a hook, the later the catfish spawn will tend to be thanks to water temperature trends. 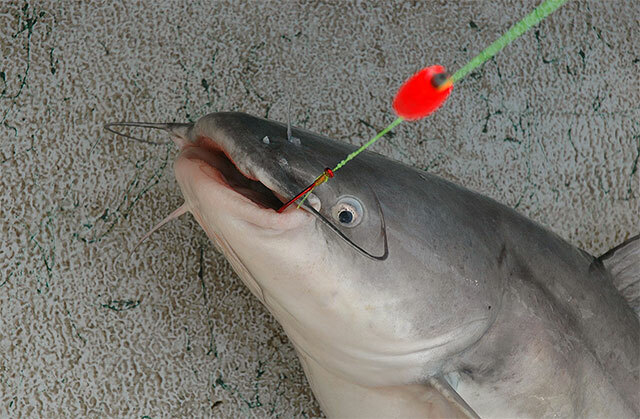 What are the best techniques for anglers to employ if they’re looking for a limit of tasty catfish filets? While the biologist admits that traditional stink-bait catfish lures certainly have their place, he prefers something that isn’t quite so smelly and messy. As long as you don't make contact with its pincers, that is! Hysmith's suggestion is especially true when a crawfish is fished weightless, allowing it to move around and flash its claws, something guaranteed to attract the attention of a hungry whiskerfish. Whatever the bait that a catfish angler chooses to use, it’s advisable to keep the hook well covered. “If they feel the hook, they’ll spit it,” said Hysmith. What time of day is best? The longtime fisheries biologist recommends later in the day when dissolved oxygen is at its highest level. While I'm not the world's greatest catfish angler, I have seen the truth of Hysmith's advice, getting in on some prime time early summer whiskerfish action at Lake Texoma. One such trip stands out from a few years back as I tagged along with a couple of veteran North Texas whiskerfish enthusiasts, Charlie Coder and Kelwyn Ellis. In the final hour or two of daylight and on into the evening dusk, we caught channel cat after channel cat as the whiskerfish stacked up in the shallows for their spawning rituals. While we didn't keep many, we did keep enough for a good meal of keeper-size channel cats. The most interesting thing to yours truly – again, while admittedly being far more of a bass angler than a catfish aficionado – was that our success that evening came in waves. We'd go a while and not catch anything at all. And then when we finally did catch one, multiple other catfish hook-ups were soon to follow. That isn't unusual I'm told since catfish will move around a fair amount. As a result, Hysmith advises that it often pays to wait them out, " ... stick and stay and make them pay ... " as former world duck calling champ Barnie Calef often says – if the action gets a little bit slow. “Catfish will move around by school size, so in other words, a school of 18- to 20-inchers will move around together,” said the biologist, an Oklahoma State University alumni. And when that happens, there can be little doubt that it is catfish time, a great time to wet a hook to find a big pull at the other end of the line. A pull that signifies one of the few silver linings – as in whiskerfish silver – that lies ahead after weeks of flooding rains in the waterlogged southern Great Plains. Not to mention a pull that means it's time to heat up the peanut oil in the fish fryer for one of the year's best meals of all, golden nuggets of fried catfish spilling onto an angler's plate.